A few tips on getting new stairs is to start with you stair rails. The rails can come in many different shapes and sizes. If you have time you can go and check out the different types of rails that are available before you start building. 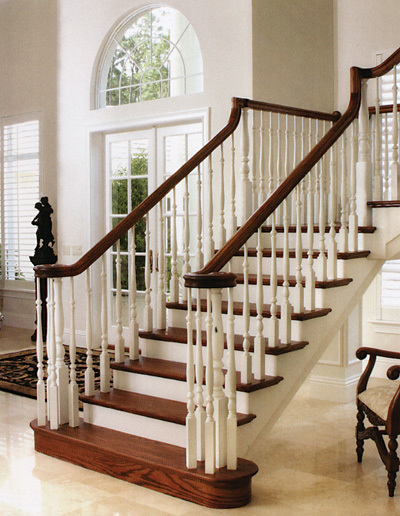 There are many different styles and wood species that stair parts are made of. In fact it is common today to have iron balusters with wood handrail. In an industrial setting metal stair parts are actually very common. In a residential setting you will see a lot more wood parts for the stairs. Wood is warmer and feels more welcoming. You really can benefit by creating the most beautiful staircase that you can. It can set the tone for the rest of your home. A lot of times it is the first thing that people will see when they visit you. You want to make sure you give them a good first impression.